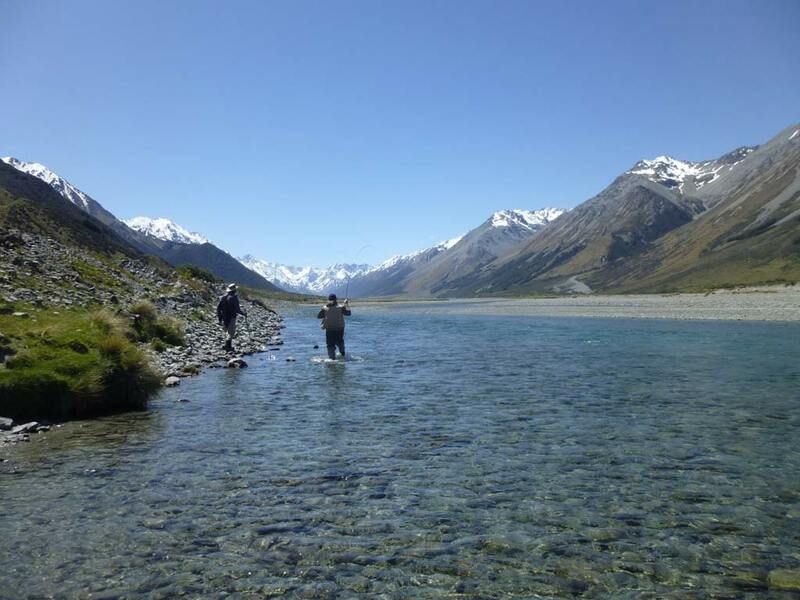 Due to a mix up at Central South Island Fish and Game, the high country season opened nearly a week earlier than normal. 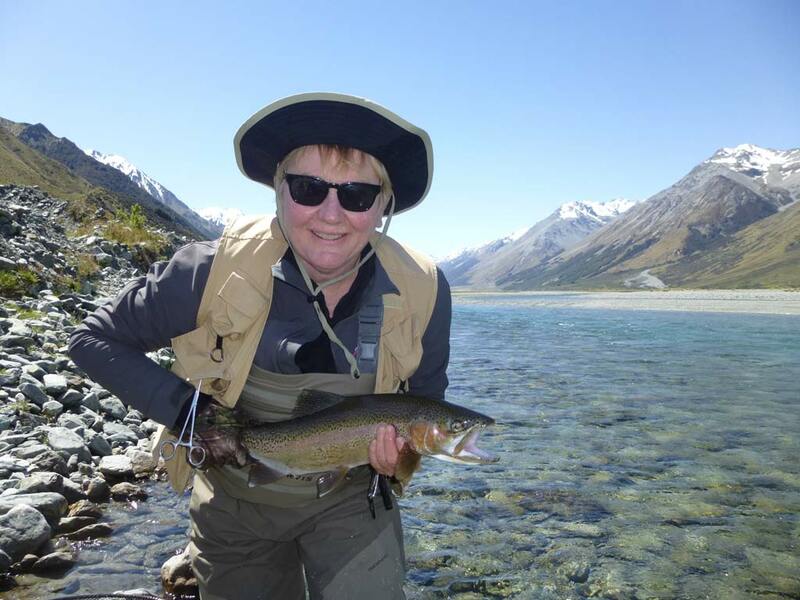 Up here the start date is traditionally the first Saturday of the month of November and this will be the case in 2016 I'm informed by the staff at Fish and Game in Temuka. 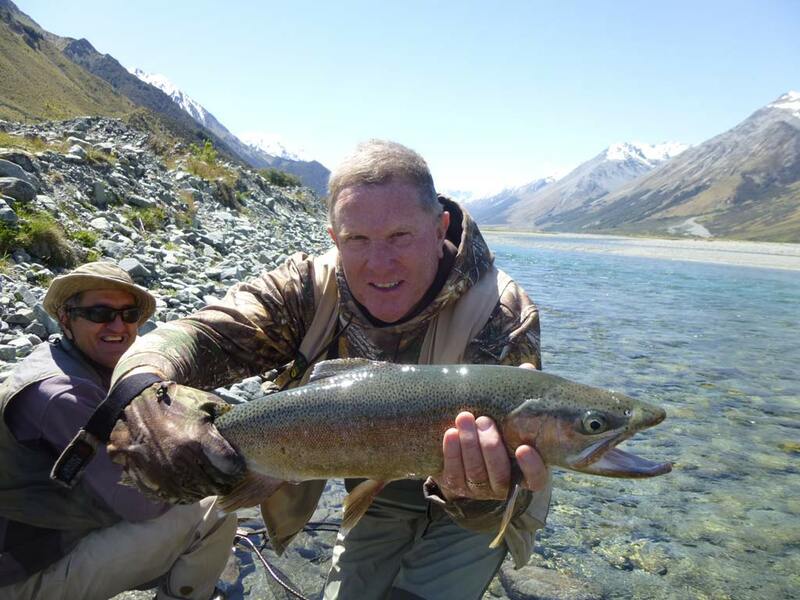 The later start up here, as compared to the lowland fisheries, is to protect our rainbow trout still spawning even as late as into December. As is usual for the Spring, the weather is very changeable with all seasons present!! To top it off the weather this year is being influenced by El Nino ocean currents which produce strong winds and dry conditions east of the main divide in the South Island. Anglers need to have a hat with a chin strap and a rod capable of handling the tough conditions - #6wt minimum with a tip action. With good technique it is possible, (but maybe not pleasant!) to battle a howling head wind. Of course guides always try to offer the most "sheltered" waters to clients where possible. While there have been many windy days so far there have also been the occasional "gem" - bright sunny day with little wind. Rich and Lisa struck one of those days so we ventured up country to take advantage of the great spotting conditions. The river ran crystal clear, the sun shone brightly and the wind stayed down - truly the ideal day for fly fishing! 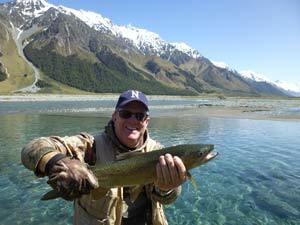 Rich latched on to his first rainbow of the day, a moving target that required many casts until the fly and trout finally made acquaintance! The others followed a similar pattern, moving around the pool until we were able to get the fly to them ... a great day's fishing with lovely people in a stunning setting. Does it get any better?" Rich with a wild rainbow trout in NZ paradise! Ladies know how to fly fish too!